As the Tories continue to thrash around over Brexit, fighting like so many rats in a sack, the business of smearing Labour goes on. And there is no more accomplished smearer of Labour than alleged historian Giles Udy, who is paranoid with it, just to be on the safe side. He has attempted to link Jeremy Corbyn to a document which suggests the UK will be roamed by death squads and there will be forced re-education under Labour. This sounds real blood-curdling stuff. But there is a problem. The document, such as it is, has nothing to do with the Labour Party. 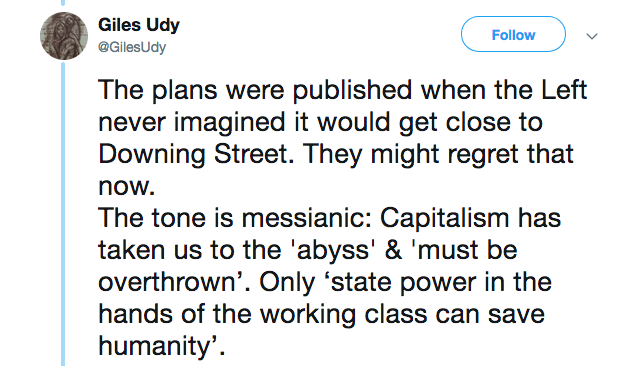 This presents a problem for Udy, whose credibility took a nosedive last year after he claimed there had to be a Stasi file on Jezza because he would have met East German party officials when visiting the country. 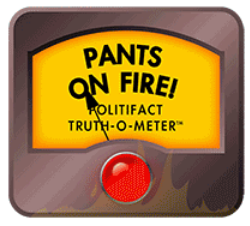 There was no file: Udy was bust. He had, like the Murdoch press, been caught inventing evidence. 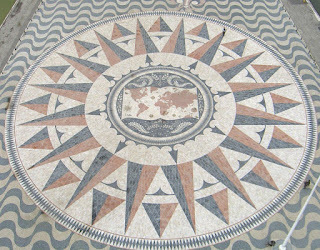 Still, onwards and, er, onwards, eh? So off went Udy to advertise his latest article for Standpoint magazine. 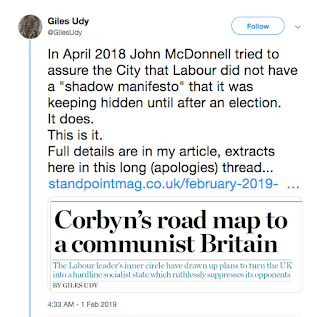 “In April 2018 John McDonnell tried to assure the City that Labour did not have a ‘shadow manifesto’ that it was keeping hidden until after an election. It does. This is it. Full details are in my article, extracts here in this long (apologies) thread”. Yes? Yes yes? Yes yes yes? 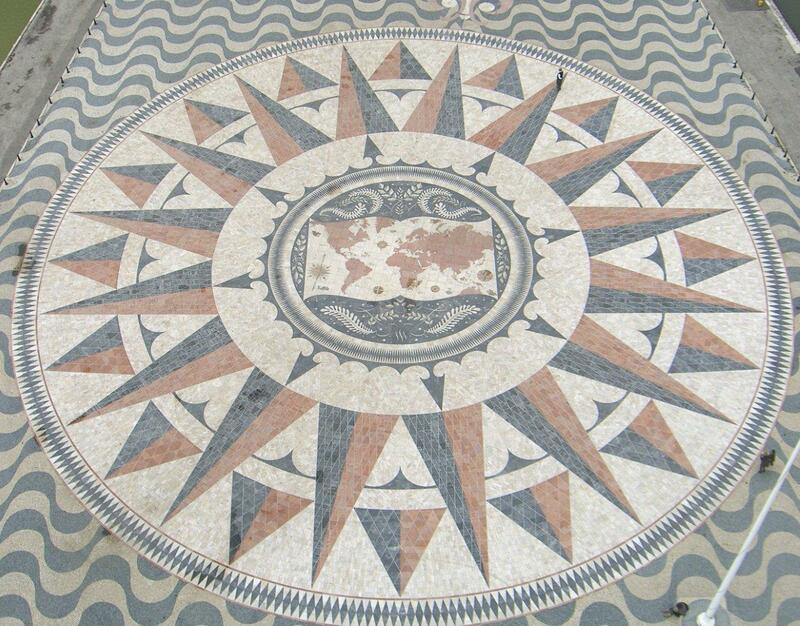 “The plans were published when the Left never imagined it would get close to Downing Street. They might regret that now. 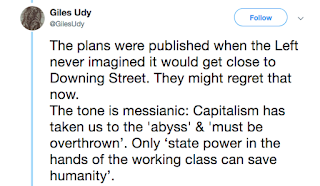 The tone is messianic: Capitalism has taken us to the 'abyss' & 'must be overthrown’. Only ‘state power in the hands of the working class can save humanity’”. Scary stuff. Do go on. “The revolution will run through three stages. 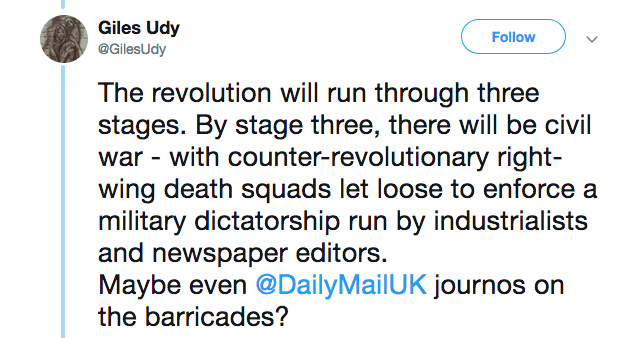 By stage three, there will be civil war - with counter-revolutionary right-wing death squads let loose to enforce a military dictatorship run by industrialists and newspaper editors. Maybe even @DailyMailUK journos on the barricades?” Er, I’m not sure this is a real Labour Party document. But carry on. “To head this off there will be purges of the leadership of the police, civil and diplomatic service, judiciary, army and security services, and their replacement by 'supporters of the revolution' (just like the old Soviet commissars) - with political re-education for lower ranks”. Giles, just where did you get this assemblage of hokum? One quick scan of the Standpoint article is all you need. “The Communist Party of Britain (CPB) has published its own 25,000-word programme, Britain’s Road to Socialism, which goes into considerable detail about the revolution that is to come”. 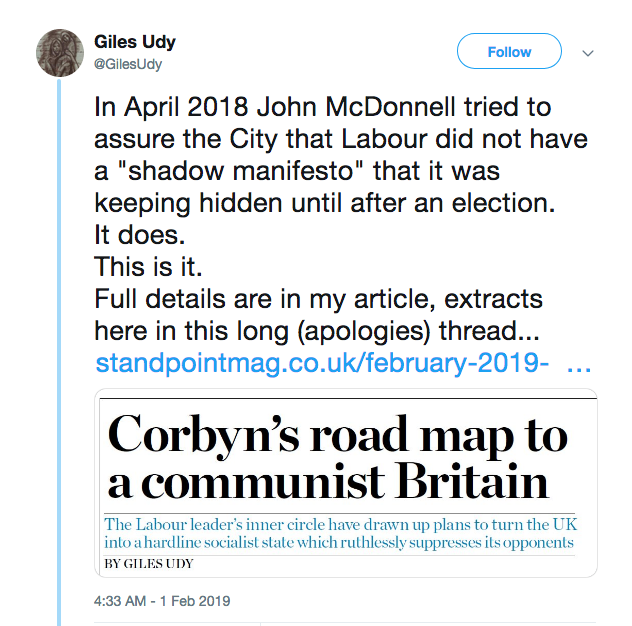 Er, Giles, mate … this isn’t a Labour Party document. Ah, but Giles has an excuse ready. “As political labels to describe followers of Marx, ‘socialist’, ‘democratic socialist’, and ‘communist’ are virtually interchangeable”. No, Giles, they really aren’t. 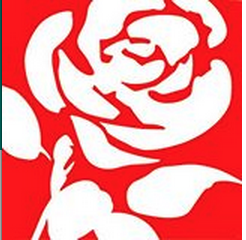 And quoting a CPB programme as if it were Labour Party policy is fraudulent in the extreme. Giles Udy actually had some credibility left after those totally untrue claims about Corbyn’s visit to the then East Germany. We can be sure about this because he just sprayed it up the wall claiming that a Corbyn led Labour Party would implement a programme from another party if it came to power. We’ll see the proverbial flying pigs first. He’s not a historian, he’s a paranoid fraud. No change there, then. What price a "2019 Zinoviev letter" coming soon with the Daily Heil? Come the revolution, Murdoch and Rothermere will be first to get splattered by the custard pie squad. Always assuming they haven't fucked off sharpish behind the Pentagon and Langley skirts. Bring it on, I say, bring it on. There! That should add to my file at Vauxhall Cross......As for you, Tim Fenton, you'll be water boarded at the Guantanamo Gulag before they'll let you blog again. 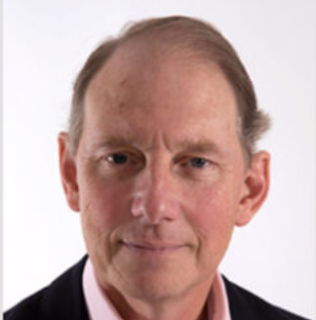 "Giles Udy" is another way of saying "Otto Winnaker".